Whole grain salads are the staple of our spring and summer table, where you’ll regularly find compositions featuring quinoa, millet, barley, and bulgar along with a plethora of fresh, seasonal vegetables. Our newest love just happens to be farro, a hearty and deeply satisfying grain that we adore because it pairs so nicely with such a variety of fresh local ingredients year-round. Ever popular in Europe, and gaining a reputation in the states, farro comes in whole and pearled varieties. 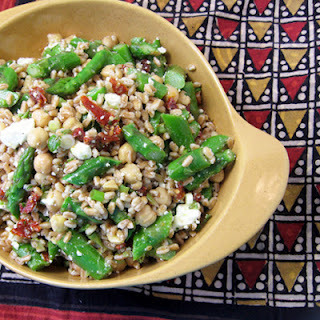 Using pearled farro cuts down on cooking time and gives farro the opportunity to be the star of even the most hurried weeknight meals. We’ve found that toasting the farro in butter prior to cooking intensifies the grain’s naturally rich, nutty flavor. In this dish, we’ve combined asparagus, green onions, and fresh oregano to give the dish a distinctly spring-like flair. Sundried tomatoes give a nod to the impending summer harvest. Chickpeas offer protein. And feta cheese pulls everything together, giving the dish a Mediterranean flair and offering a counterpoint to the tangy lemon dressing. 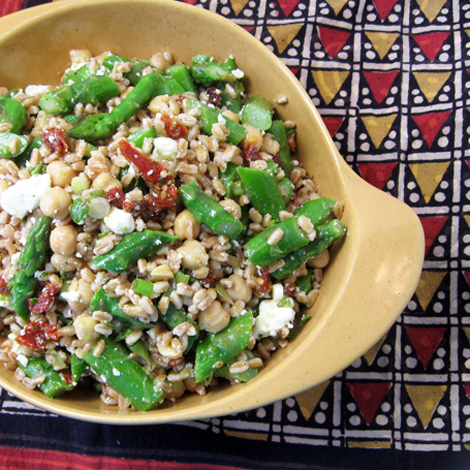 I've never tried Farro before. I'm sure this would be pretty tasty with barley though. I'll eat farro any day. What a pretty salad it is. Tasty too! Can't wait to try this recipe, but first I need to get to Outpost to restock my dwindling farro supply! This looks great. I love farro, but for some reason it is so elusive around here. I have looked at every store and only Whole Foods has it, and they only have one option, which is a pretty small imported bag that costs like $9. Sort of hard to justify very often when almost every other grain I can think of is in the bulk section for less than $2 a pound. :) But it's worth it occasionally! 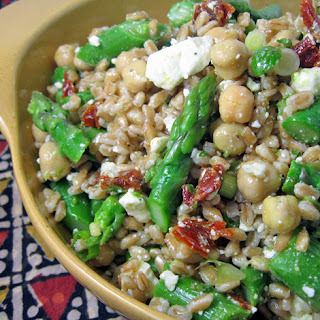 We've really discovered Farro in the last year or so too, such a great ingredient. hmmm such a great idea. I love farro too. thanks for sharing.